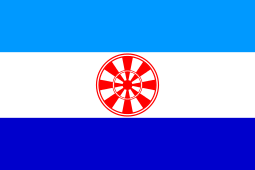 Not to be confused with Evenk Autonomous Banner. Evenk Autonomous Okrug (Russian: Эвенки́йский автоно́мный о́круг, Evenkiysky avtonomny okrug; Evenki: Эведы Автомоды Округ, Ēvēde Avtōmōde Okrug), or Evenkia, was a federal subject of Russia (an autonomous okrug of Krasnoyarsk Krai). It had been created in 1930. Its administrative center was the urban-type settlement of Tura. As of 2006, at 767,600 km², it was Russia's seventh largest federal subject, and the country's least populous: 17,697 (2002 Census). 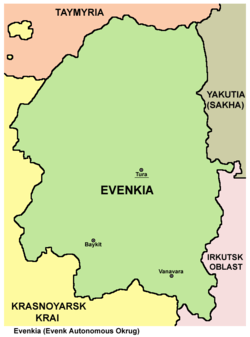 Following a referendum on the issue held on April 17, 2005, Evenk and Taymyr Autonomous Okrugs were merged into Krasnoyarsk Krai effective January 1, 2007 (some Evenks contested the results, however). Administratively, they are now considered to be districts with special status within Krasnoyarsk Krai; municipally, they have a status of municipal districts (see Evenkiysky District). Boris Zolotaryov was the last governor of the autonomous okrug. Of the 17,697 residents (as of the 2002 Census) 2 (0.01%) chose not to specify their ethnic background. Of the rest, residents identified themselves as belonging to 67 ethnic groups, including ethnic Russians (62%), Evenks (21.5%), Yakuts (5.6%), Ukrainians (3.1%), Kets (1.2%), 162 Tatars (0.9%), 152 Khakas (0.9%) and 127 Volga Germans (0.7%).